Let's face it...it's not always easy being single these days. The reality of life means that, even though it may have its benefits, it's not always easy to remain positive when you're not in a relationship. 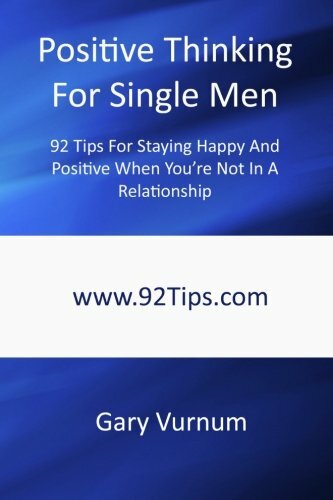 Positive Thinking For Single Men: 92 Tips For Staying Happy And Positive When You're Not In A Relationship is a simple and easy-to-apply book in which you will discover ninety-two tips that will help you stay happy and positive whether you're going out with someone or not! Also included...FREE access to the "9 Critical Steps To Immediate Self-Confidence" Report in which you will discover... - Why removing one single word from your life will have an immediate positive impact! - The one-second change to your thinking that will forever change how you look at yourself! - Why changing your focus away from you will help you become more confident. - How just a few minutes now and again can have a massive impact on how you feel about yourself. - PLUS a special gift worth up to $120!